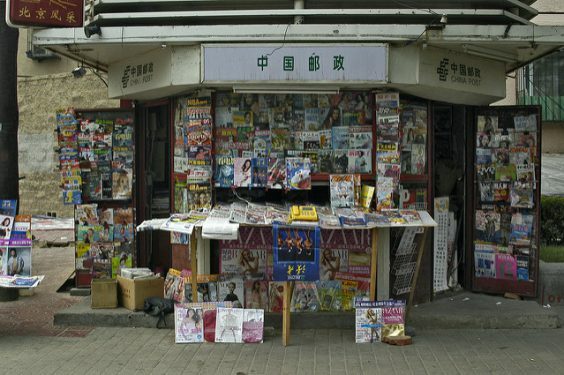 A magazine kiosk in Beijing. Image via Flickr user: Peter Ashlock. The shutdown of an esteemed liberal Chinese newspaper by government affiliates reveals the Chinese Revolution devouring its own. “The revolution devours its own children,” the German writer Georg Büchner wrote in 1835. The famous quote comes from his his four act play Danton’s Death, which describes the last days of the French revolutionary leader Georges Danton before his execution. Büchner let the eloquent orator Pierre Vergniaud, a statesman and lawyer, deliver this famous sentence before he was brought to the scaffold. Half a year later, Danton and the other fourteen politicians who had engaged themselves passionately in the great revolution all followed the same fate as Vergniaud and ended their lives under the guillotine. The revolution drowned in its own blood. In 2013, Xi Jinping became the president of China. He reached the highest level of power and became the General Secretary of the Communist Party and the Chairman of the Central Military Commission. Xi did not fight for his life to gain such authority like in a fairy tale; the power just fell on his shoulders. Yet all the same, Xi began to eliminate his opponents one by one and whitewashed it as an anti-corruption movement. The act won him a lot of sympathy among the common people. The arrest of dissidents and the subpoena of over three hundred human rights defenders in the country has silenced his critics for a while, but also annoyed some bold leaders from within his own front. This journal has survived a quarter century, and it is well known for its relatively liberal and reformist point of view. With strong political patronage at its back, it dares to touch on sensitive topics, although its website has been closed forcefully several times because of political reasons. In 2008, it published a series about the denounced former premier minister, Zhao Ziyang, who lived under house arrest for sixteen years, from 1989 until his death. These articles touched the nerves of the Party and the journal faced a shutdown. If President Hu Jintao had not stepped in to support the publisher, it would have meant the end of the magazine. Yanhuang chunqiu is closely related to the CCP, as many retired high cadres are in its author pool. The head of the journal is Du Daozheng, an old media man, who served the communist regime for decades. Du was the publisher for the Xinhua agency, editor-in-chief for Guangming Daily, and Chief of the Bureau for Press and Publishing Affairs. The famous journalist and writer Yang Jishen was his deputy. Yang Jishen’s huge work, The Tombstone, is a comprehensive account of The Great Famine of 1959 to 1962. The documentary exposes the fatal policy and its consequences of Mao’s and the Party’s Great Leap Forward. Yang’s own father starved to death during the famine. It must be a secret compromise among different political groups that Yang could publish his book and did not have to spend the rest of his life in prison. Yang worked at Yanhuang chunqiun until 2015. This semi-official magazine reads almost like an uncensored independent journal. The content is interesting, and the articles deal with many historical figures and miscellaneous sociopolitical issues from the past. In most of the texts, the reader could find some so-called internal information, which would never reach normal people. It has been tolerated by the CCP since it works like many valves: it lets out some of the inner pressure of the party which would otherwise threaten to explode. Yanhuang chunqiu sells 190,000 copies of each issue, as it is favorite reading for politicians and intellectuals. Yet its good fortune won’t last forever. The magazine has long been a thorn in the side of the regime. In July, the contractor with the Chinese National Academy of Arts sent out people to occupy the publishing office and the whole staff on key positions. The publisher, Du Daozheng, his deputy, Hu Dehua (son of Hu Yaobang), and editor-in-chief Xu Qingquan, were removed and replaced with the Academy’s own people. The advisory board members, who were known for their liberal thinking, were also replaced.